Well I have been revisiting old stuff and I was on the Mj Producer BeLIEves Michael is still ALIVE article on TMZ which was added in 2010 and I found the Poll and these are the results haha! Quite astounding to be exact! 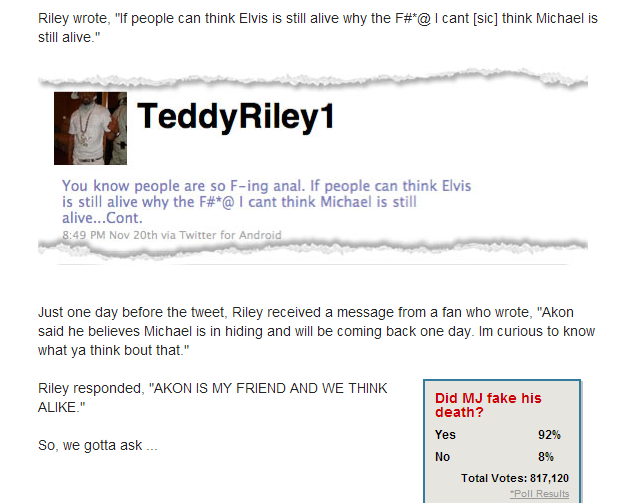 Out of the 812,000 people who voted on the poll 92% of them think MJ faked his death! Yeah I know haha even if lets say 200k or 300k of them were multi votes it still leaves 500k of them legit haha.